A few days into our stay in Dahab, after my computer has fully recovered from its crash and our purse is 150 LE lighter for the ordeal, I am offered employment in Saudi Arabia. I am in the running for a job in China as well and so now I have to make a choice. In all honesty, I didn't expect the Middle East position to eventuate. I thought the telephone interview went horribly wrong. The difference between employment conditions in these two countries could be described as world's apart, even though geographically they are not. The benefits weigh highly in favour of the Saudi job, but the cushy package comes at a cost. In China, I wouldn't have to abide by a strict dress code, nor would I live in a compound and neither would I be entering the world's most repressive regime as far as women's rights are concerned. The closest I'll get to riding a bike is in the small gym attached to the all-female apartment block. And then I'll be sharing it with 100 other occupants. The Chinese contract would also mean paying for my own rent, my transport to and from work and forking out 20% tax as well as covering the costs of all my airfares, much of the visa documentation and medical expenses. I would also have to foot the health insurance bill. In the tax free environment of Saudi Arabia, all of this is well looked after plus there is an extra $US1000 per month in my pocket and a house maid. And while I have no illusions that the job and culture will be anything but challenging in the Kingdom, I am quite looking forward to teaching young female students preparing for their entrance to university. Even though many have expressed their concern for my decision, it kinda feels right to make this move. I get plenty of time to think about the decision on the slow uphill grind from Dahab to Nuweiba. It is a tough journey and before we reach the checkpoint and turnoff to Saint Catherine after 46 kilometres and 709 metres of altitude, we have stopped many, many times. Around lunchtime, we had pulled off the road near some trees for some food and recuperation from the burning sun. Finding ourselves in the same spot as a small Bedouin party is not surprising, there are very few places to rest in the desert. They call us over for tea, which is an obligatory offering from these nomadic people and a refusal is never accepted. It is hard to explain the run of events and there are no photographs to prove anything. We didn't think it appropriate to bring out the camera. 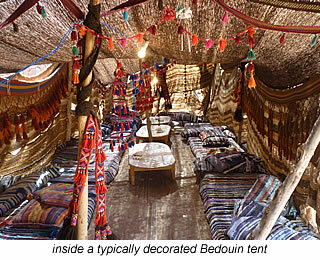 Just being able to experience the true Bedouin way of life was special enough. Time is steady with the Bedouins; they don't rush. Two men are making tea as we arrive and one has moved the mats around so that we have space to sit in the shade as well. A couple of goat skins, one wrapping meat and the other with fermenting milk for cheese, lie close to us. Their black fly covering takes to air in a deafening buzz with any sudden movement or momentary strong breeze. Three camels chew on anything green that they can get their teeth into; the prickly the better, so it seems. They also have a go at our bikes as well, though there is hardly anything fanciful for a camel on board. We can hear the goat herd behind the ridge. As the midday prayer resonates, one of our hosts picks up a jug of water and moves aside to clean himself. The call can be heard all over the desert. There are enough communities dotted around and therefore ample mosques. He prays a few feet from where we rest, on a little red mat which he points towards Mecca. His wife is getting flour out of the plastic hessian sacks and we are on our second cup of tea. Bedouins and Egyptians always laugh at the little amount of sugar we desire. They in contrast take their tea weak and syrupy sweet. A twig-fire contained in a ring of rocks, is constantly being fuelled by one member of the camp. The same communal care is taken when making the tea. The fire has not only boiled water in an empty tin can, warmed up the goat stew, but is about to heat up the metal drum lid used for baking the flatbread. Flour is mixed with water and being kneaded on a wooden board - also removed from one of the large hessian sacks. By this time, the other man in the party has washed and is now praying on the same little mat placed in the sand. As he finishes, so is the dough ready for rolling and piece by piece they are flattened thin and thrown on the hot lid, where they bubble and curl until ready. Lunch is boiled goat meat and flatbread with more sweet tea. When we explain that we are vegetarians and that the bread is enough, a can of fava beans is dug out of the supplies, onion and garlic chopped up and fried in a small metal bowl balanced over the flame. Meanwhile the beans are mashed with the bottom of the tin they came out of and a quite delicious foul eventuates. We can all begin the meal. Traditionally Bedouin women do not remove their scarf when they eat or drink in the presence of men. Instead they hold it out a little with one hand, stick their other underneath and tilt the cup towards or place bread in their mouth. If the bowl is a bit large, they will often just turn their head away. No matter how many times I see this, it still seems strange to me. 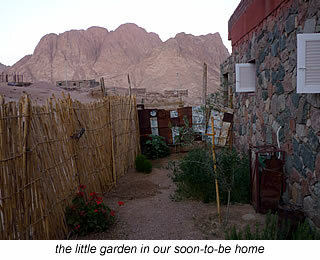 But like many customs I experience here in the Sinai, the strangeness is only because I have been brought up with entirely different traditions. On one hand, I agree that as a western woman I have many freedoms which women of this region will, more than likely, never experience. On the other however, sitting here watching this perfect example of self sufficiency and - apart from throwing the used tin can into the bushes - a harmony with the land, I wonder who is most free. While I wouldn't want to trade places permanently, I am fascinated by the ability of the Bedouin to instinctively exist what they have around them. Which in our terms is very, very little. After nearly two hours, we have to drag ourselves away. We still have a long way to travel. After the check point, it is 5 kilometres of some pretty substantial climbing to reach Migrah 1 and we are still not at the top. Another 4 kilometres and 91 metres of gain and we finally reach the peak [868m]. A bit of undulation follows until the start of the 15 kilometre downhill tumble to the coast. 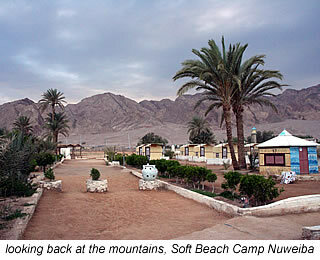 There is still another 9 kilometres to go before we finally roll the bikes in at Soft Beach Camp in Nuweiba (79km; 956m). We spend a few days right on the ocean of which one was spent chatting with Tariq from Alternative Egypt, who we have had contact with via email, but never met in person before. Other than a few beers, a good natter and the fact that it is Easter, it is a pretty non-eventful visit to Soft Beach Camp. But then again, I guess that is what most people come here for: just a bit of simple non-eventful relaxation. Relaxation is furthermost from my mind as we force ourselves back up the 15 kilometre and 781altitude metres of ascent in the direction of Saint Catherine. After a total of 33 kilometres, we are back at the checkpoint, where they refuse to give us any water. Luckily the military checkpoint is only 10 kilometres further on and we know from our precious trip, they are a little more hospitable. They even give us a cup of sweet tea and a couple of jam portions for our bread too as we rest before the short cycle to our camp spot for the night 24 kilometres after the Dahab turnoff (57km; 1195m). It is 360 metres off the road and well secluded, though a little sloped. The ground also has plenty of rocks to place on the snow-flaps. A feature we love about our Helsport tent. Besides it is our last night of wild camping for quite a while, so we are not too fussed. 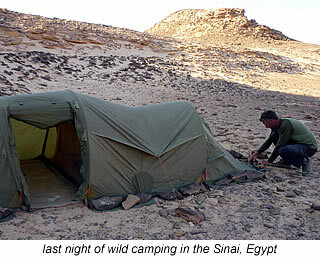 It is just a pleasure to be out - seemingly alone - here in the Sinai desert. We have had some pretty amazing wild camping moments in the last 5 years. This little pleasure - which took a while before we were good at choosing the right spots and feeling comfortable about doing it - has to be one of the highlights of cycle touring. These moments are when you really feel the high of self-sufficiency and of being a part of Mother Nature's wonderful landscapes. The Bedouins have a saying: When you sleep in a house your thoughts are as high as the ceiling, when you sleep outside they are as high as the stars. I have to agree with them. 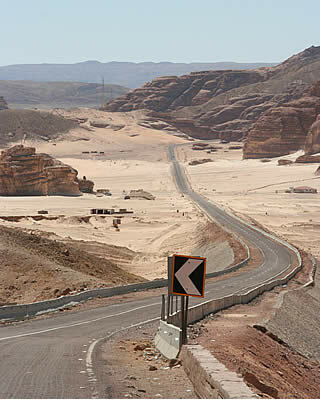 It is a familiar journey back to Saint Catherine and part of the road reminds us of our travels through Death Valley in the USA. While it is no where near as hot as it was there, it is still very thirsty work. There is an ambulance post [28 kilometres from the military checkpoint], so water should be available here. We still have enough on us from yesterday's fill-up. The airport turnoff comes after a difficult 48 kilometres and 765 metres of climbing. The welcomed check point is a further 5 kilometres on where we face unwelcome wind and the last 11 odd kilometres back to Bedouin Camp are a hard slog. We never really planned it, but that is how things are on the road and after 4 years and 9 months of cycle touring the world, we have decided to stop. What with circumstances as they are in the Middle East and Ali fracturing his ankle, we woke up one morning to the usual blue skies of the Sinai and said: Now is the right time to take a break. Not only do we still want to cycle through the Middle East, but we would prefer to do it when there is less tension. We also came to the realisation that the cycle touring funds were becoming rather low. It is going to be another chapter to add to our travelling story and sitting here in a little Bedouin brick house with goats bleating and big red mountains surrounding me, I feel quite happy to have my mind dawdle through all the amazing things we have experienced in the last years. Quite often, it is hard to put things into perspective while you are on the road. So besides padding up the bank account over the next year, we intend to write plenty more about cycle touring and travel in general, as well as try to publish something that has been on the back burner for a while now. Food: being one of our favourite pastimes, has led us to the decision to put together a detailed eBook on the art of travel cooking. It will not only have plenty of tips and tricks regarding the travel kitchen, but be full of travel-smart recipes for cycle-tourers and anyone really planning to self cater while on the road. Thanks to everyone who has supported us for our first 60,000 kilometres, we really appreciate it. Getting back to the clean mountain air of Saint Catherine is wonderfully refreshing; especially after the heat of the coast. Salah organises the place out the back in the garden for us to stay in, where we at least have a bit of privacy and can start sorting out the next stage of our lives. As well as having - quite all of a sudden - a scary collection of large glass bottles containing oil, soya sauce and other such kitchen condiments, someone gave us a liquidiser and the number of items we now own has doubled since we arrived. While that is still not anywhere near what most people manage to tuck away in their houses, it is a dramatic change for us, after five years of always keeping our luggage to a minimum and shopping for products that are traveller friendly. Putting the house hunting feelers out with even more gusto is first on the list, but trying to find something decent to rent in Saint Catherine is frustrating. We see a dozen places all up: some just a shell with no roof and others in a terribly sad state. One lady shows us a besa block room where the stairs no longer function as stairs since they are in the same state as the ceiling, which has caved in and the outside toilet possesses no door. A small sky dish lay in the front-yard-come-local-rubbish-dump and she is telling us that the room comes with satellite tv. Another landlord even goes as far as trying to get us to sign on the dotted line, while he paces up and down a vacant block of land describing what the house he is about to build will look like. We have been warned by a number of foreigners here to never give any money up front and never make a decision on hearsay. It is good advice. We are quite despondent at what we have seen until just before the end of the month. A little cottage up on the foot of the mountains, overlooking the village comes up for rent. It is the first place that has decent wiring, painting, door frames and windows with netting. It will also be fully fitted with cooker, television, refrigerator, bed and there is a small garden as well. It is actually perfect in all aspects except for the potential problem of whether internet can be satisfactorily accessed from this position. Sadallah, our soon to be landlord, initially quotes 1350 LE per month for his house. The other warning we received was to bargain hard. Over the course of the next few weeks, this price will come down to 800 LE including gas, electricity and washing and drinking water and the next stage is complete.